Labor head Yechimovich warns against new party, says she can't imagine joining a coalition with it. MK Shelly Yechimovich, head of the Labor party, voiced her dismay Thursday evening with the formation of a united party made up of Likud and Yisrael Beytenu, and came close to ruling out the possibility that she would join a coalition led by it in the next Knesset. 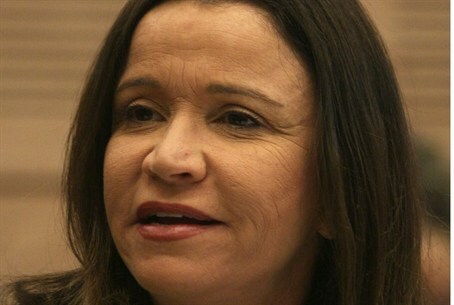 "I call upon all of the centrist forces on the Israeli political map to join the Labor party under my leadership, which is the only centrist party today, in order to prevent the Lieberman-Netanyahu party from ruling," she said on Channel 2 news. "I also call upon the numerous people who lost their political home today – Likud voters, moderate nationalists who see the government's brutal economic policy – to join Labor," said Yechimovich. Yechimovich told her interviewer that she "cannot imagine" joining a coalition with the new "extreme right, racist" party. If Yechimovich remains in the opposition, the likelihood is that the next coalition will contain at least some of the religious parties as well as Yair Lapid's centrist Yesh Atid (Future) party. Yechimovich portrays herself as a social democrat. However, she admitted in the past, before joining politics, that she voted for the communist party in 1996. She grew up in a communist household and has said that she knew sections of Karl Marx's writing by heart.